My Fall-In Game: Escape the Dungeon using “Feudal Patrol” Rules. | H.A.W.K.S. My Fall-In Game: Escape the Dungeon using “Feudal Patrol” Rules. Chris Palmer At the Fall In gaming convention, held back on November 8th-11th, Buck Surdu, Greg Priebe, and I all conspired to run a trio of games on the new Secret Weapon “Tablescapes Dungeons: Mines” terrain that Buck and I had purchased earlier in the year via a Kickstarter: Tablescape Dungeons: Mines. Between Buck and I, we had purchased 5 of the base sets, 5 of the mine track sets, and 4 of the walkway sets. I also had bought some of the riser pieces. We frantically got it all painted, with the goal of running games with it at Fall-In. The players hear the rules brief, as Buck (on the left) helps a player with a question. We picked Saturday to run our games, so we could set up Friday night. 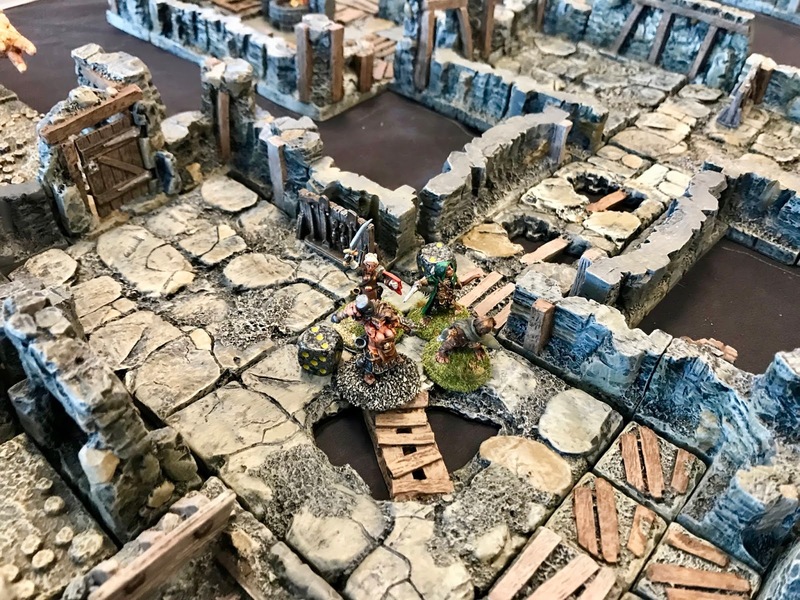 Saturday afternoon, Buck would run a GASLIGHT game set in a secret Nazi laboratory, hidden in an abandoned mine, that GI’s were attempting to raid to steal scientific secrets. In the evening, Greg would run a Dr Who game, also using GASLIGHT; that would be set immediately after Buck’s scenario, with Dr Who arriving to stop an even greater menace that would appear in the Nazi Lab. And I was set to start things off with the morning game. The Dwarves are surprised by the appearance of a dirty trick generated Ogre, bursting through a door on their right. My game was something of a reverse Dungeon Crawl, using the under-development Feudal Patrol rules. 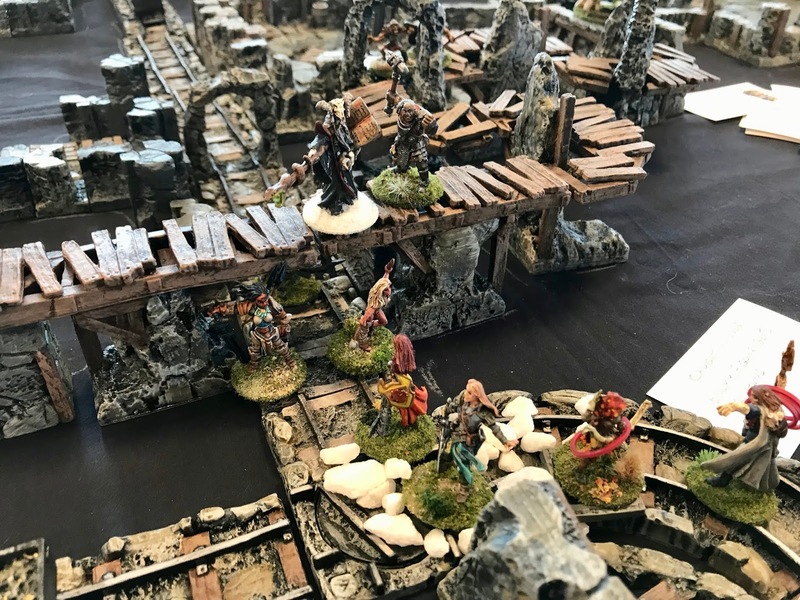 The scenario was called “Hunting Evil in Small Places”. 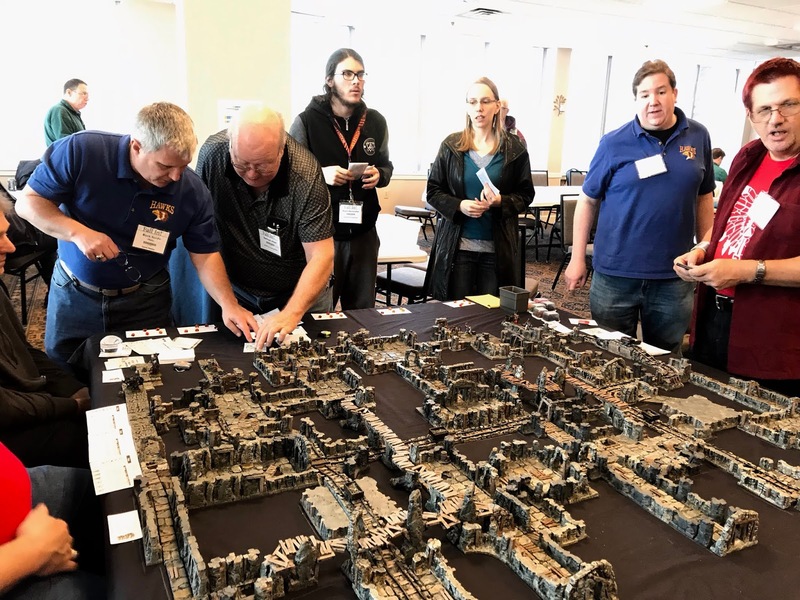 Players would each control a team of adventurers; but they would be starting at the back end of the dungeon, already loaded with treasure, and need to escape with the treasure they had found. Each player also had a half dozen “dirty trick” cards that they could play on their opponents in an attempt to slow them down and make them lose their treasure. These were things like making monsters appear, or springing traps. 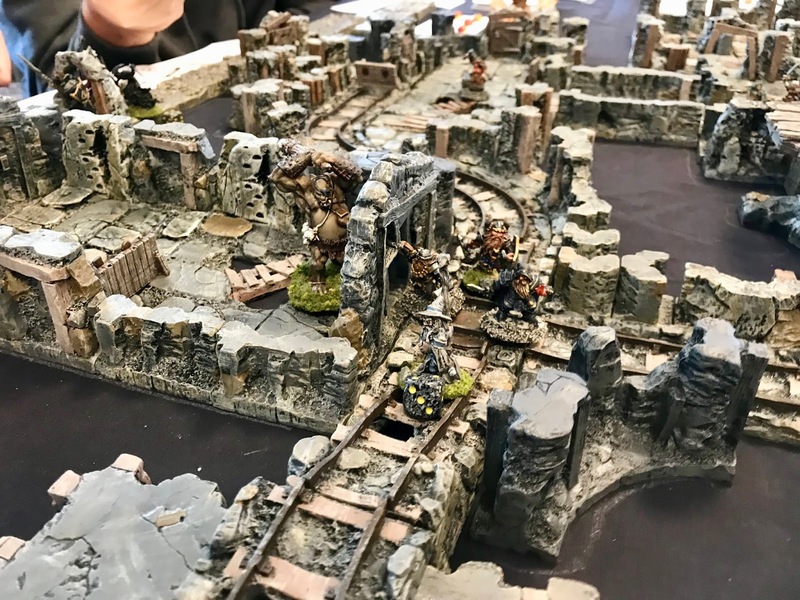 Also, on turn three, a trio of big bad evil monsters would appear at the back of the dungeon, spurring the adventuring parties to move even faster towards the entrances, or face an uncertain future. Whoever got out the quickest with the most treasure, won. The Dwarf Cleric, separated from her party, narrowly escapes some pursing Halflings. I was pleasantly surprised when I had all 6 ticketed players show up; though I sadly had to turn two stand-by players away. The players selected from a half dozen themed parties, including: Dwarves, Elves, Humans, Halflings, Drow, and Barbarians. 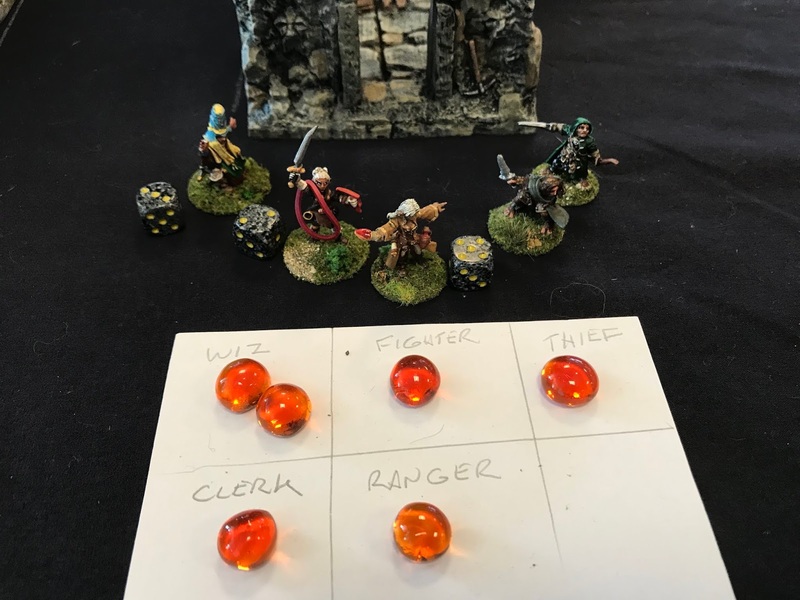 A dirty-trick generated Large Boulder drops from the ceiling and begins rolling towards the Dwarf Wizard. In the end he was able to outrun it, even with his short legs! 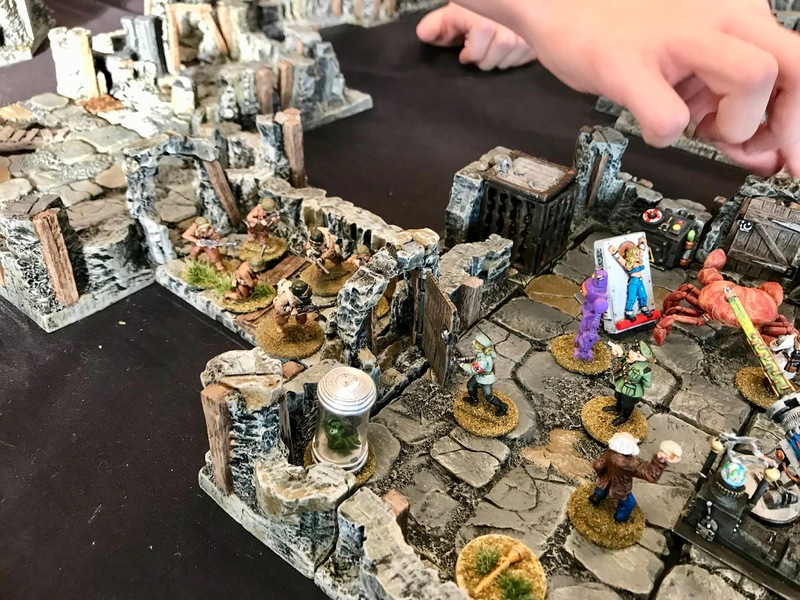 The players were quick to pick up the rules, and soon they were racing through the tunnels, and throwing monsters and traps in the paths of their opponents. It was a great crew of players, and everyone seemed to enjoy themselves, including myself. 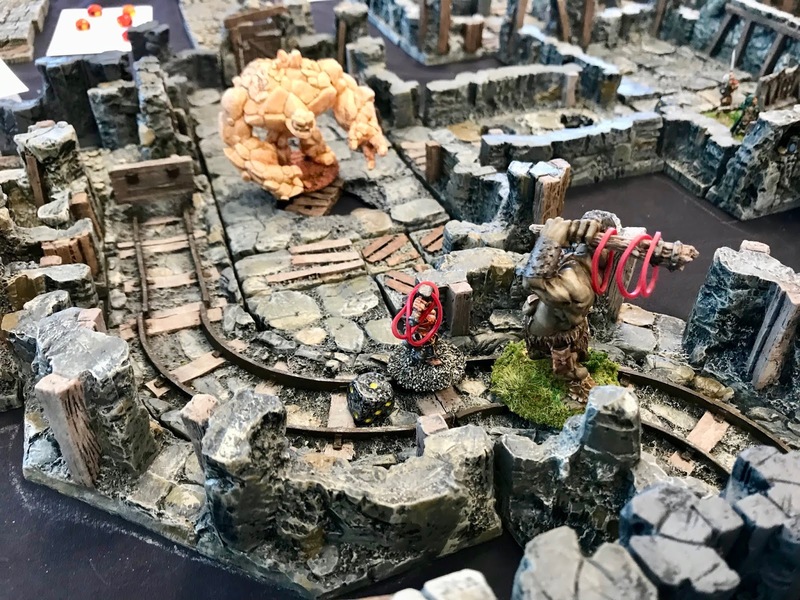 The Dwarf Cleric finds herself squeezed between the Ogre, and one of the quickly approaching big bad evil monsters. Again, she somehow escaped! A highlight for me was a big three-way brawl that broke out between the Humans, Elves, and Barbarians. All the players had a lot of fun skirmishing in the tunnels. 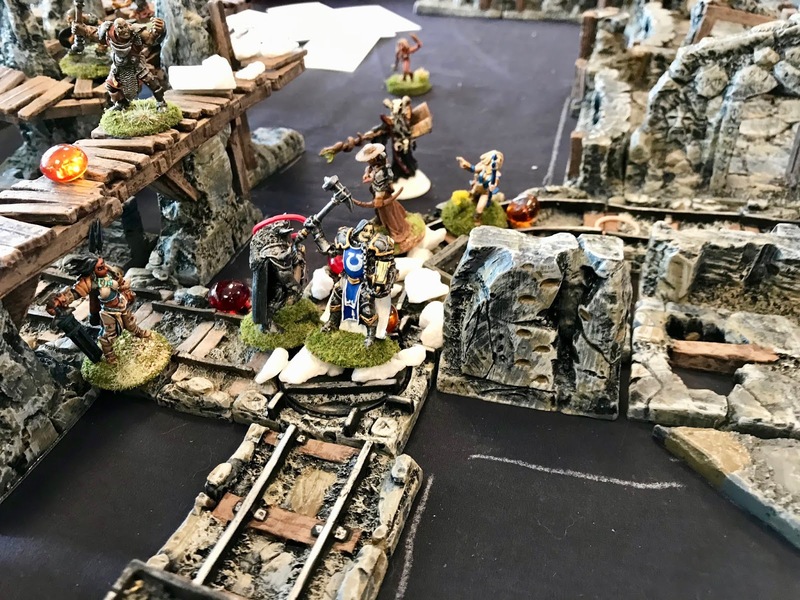 Also enjoyable was following the course of the Dwarf Cleric, who got separated from her party, and took a rather circuitous route through the mine, facing all sorts of perils, but somehow coming out mostly unscathed. The big three-way fight develops between the Humans, Elves, and Barbarians. 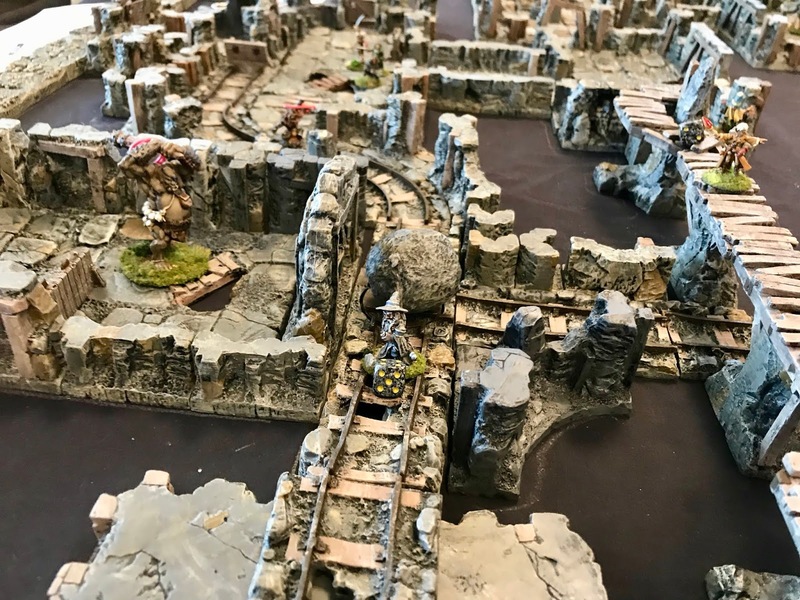 The white rocks spread around on the track are the Barbarian Wizard’s “Ice Blast” spell which created a 2"x3" section of rough icy terrain that halved movement. 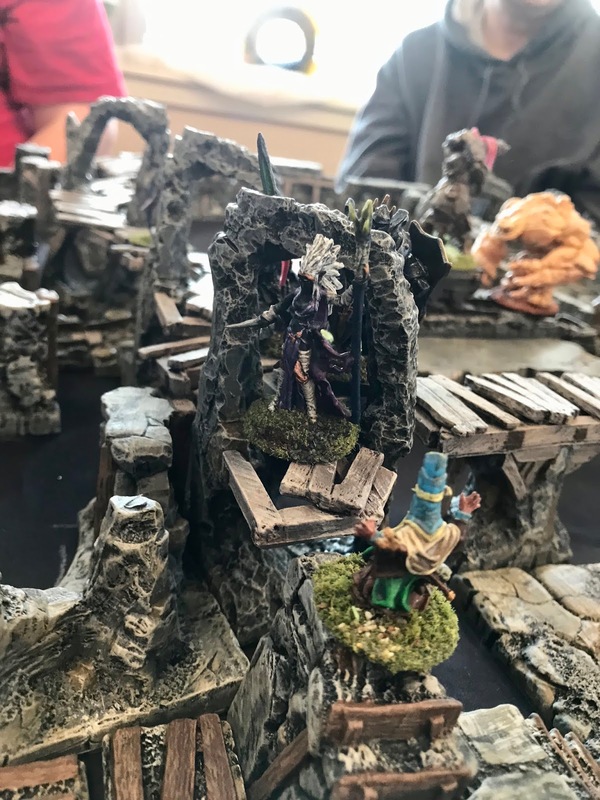 We loved the Halfling Wizards surprised look as he came face to face with the towering Drow Sorceress. 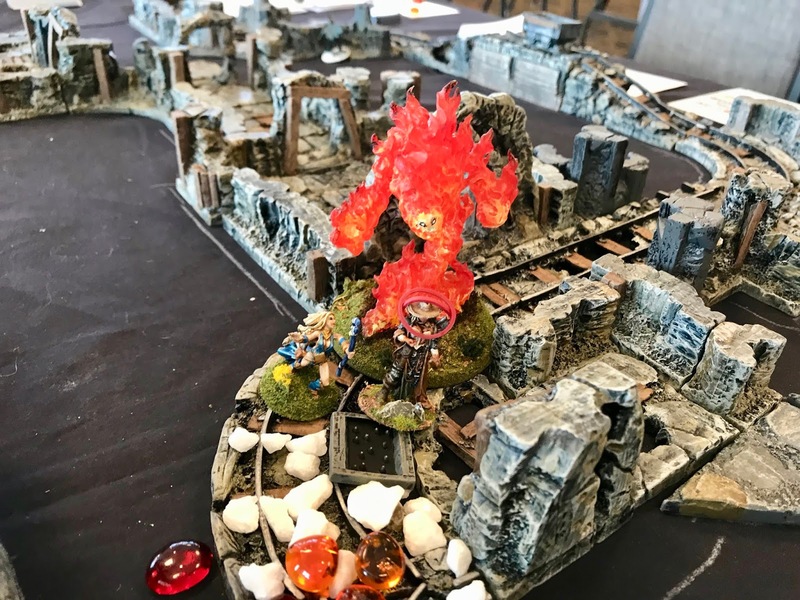 Just as the game was ending, the big bad evil monster, Flame Elemental reached the Elf Ranger, and the Ranger actually managed to damage the Elemental without taking any damage herself! A look at Buck’s Nazi Lab game, as GI’s rush into the main room. 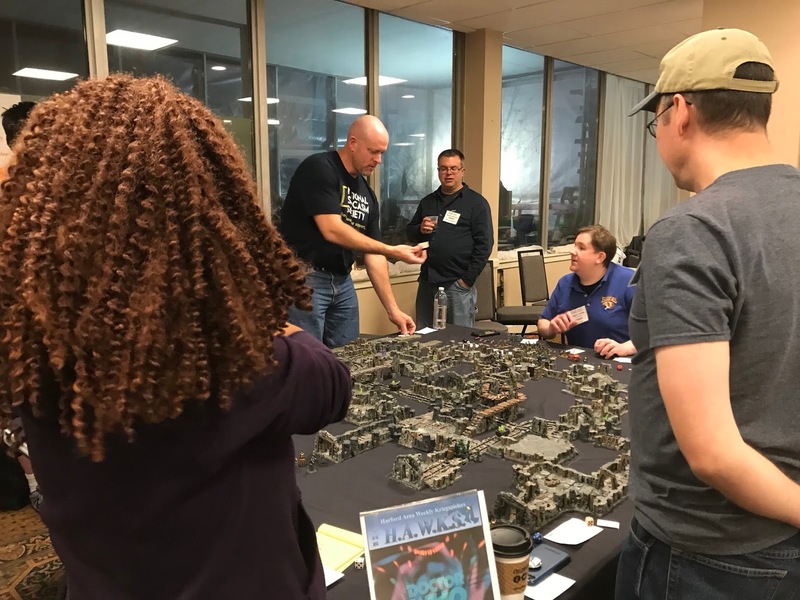 Greg, seated, running his Doctor Who game for a group of enthusiastic players..
What a cool game. I love all the dungeon bits and dirty tricks. I hope to see you at a convention (Or two) next year. Until then I’ll keep reading your posts and checking out your step by step painting. Thanks. Thanks! Glad you like the game, and my blog posts!.